June 13, 2012, 6:05 PM · What does a fine violin mean to a violinist? And what does a violinist mean to a fine maker? This was the question at hand on Tuesday, when violinist Elizabeth Pitcairn brought her 1720 'Red Mendelssohn' Stradivarius to join several other fine instruments for an afternoon of violin-testing at Pomona College in Claremont, Calif. The event was sponsored by violin maker Jim Brown and the Southern California Violin Makers Workshop, taught by Chicago luthier Michael Darnton (who also happens to be a longtime V.com member). Besides Elizabeth's Strad, other instruments at this event included Dr. William Sloan's 1714 "Jackson" Stradivarius and 1742 Guarneri Del Gesu; as well as my colleague Laura Rosky-Santoni's Mantegazza; a Vuillaume, and more. "The advantage of having a student work with a fine violin is that they can take that concept of that sound, and transfer it to another violin," Elizabeth said. Elizabeth has worked with a very fine violin for much of her life -- she has played (and owned) the "Mendelssohn" Strad since she was 16 years old. Elizabeth has quite a gift for transferring that sound to other instruments, and her ability to do so made for an enlightening afternoon. "Would you like to play on one of these instruments?" Event host Jim Brown, of J. Brown, Violin Maker shop in Claremont, gestured to Dr. Sloan's Strad and Del Gesu. It's not exactly advisable to perform in public on a violin with whom you're only slightly acquainted, but throwing some caution to the wind, I yanked up Dr. Sloan's Strad as my partner for this experiment. I mean, you only live once! The "Jackson" Strad is a bit larger than your average fiddle, though that didn't bother me. The challenge lay in producing the sound. I'm not completely unfamiliar with the old-Italian genre of instrument, as I play on a mid-19th century Gagliano brothers, but a Strad is older and deeper -- a whole different animal. Those 16th notes (and the first movement of the Bach double is all 16th notes and martelé eighth notes) were sounding mighty scrubby to me, using my decent but not stratospherically amazing German bow. Backstage, I shared my concerns with Elizabeth: that the instrument really couldn't take a lot of force, and yet backing off didn't really seem to help, either. I was having trouble finding the sound. She knew exactly what to do, and I loved the way she switched immediately to teacher-mode. She suggested giving every single note, yes, all those 16ths, an almost consonant-like, martele-ish beginning. I had to try a few times, but it really did work. Now, I can't say I was able to immediately adjust and perform the whole first movement that way -- one does slip into familiar habits when playing in front of an audience! But I tried to stay aware of these ideas, and certainly I found it to be an informative experience. 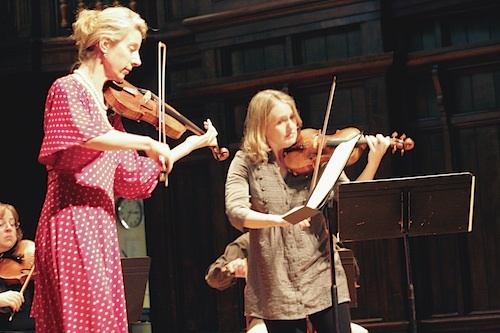 Playing the second movement with Elizabeth was 11-year-old Lydia Brown, playing on a fractional instrument her father, Jim Brown, made; and for the last movement, Laura-Rosky Santoni, Lydia's teacher, on her Mantegazza. The quartet consisted of those of us not playing solos, plus violinist Danielle Cummins, violist Kira Blumberg and cellist Eric Lindholm. When Elizabeth went to demonstrate on Doc Sloan's Strad (the one I had tried) she talked about the unusual way a player has to approach a Strad: "It's like going to punch a wall, but then you don't," she said. You can't apply too much pressure, yet you have to nudge it out. "If you want to hear great Strad-playing, listen to David Oistrakh," she said. "There's a certain quality to a Strad that you can hear right away," she said, after demonstrating an excerpt on Sloan's Strad. "There's a liquid quality that combines in your ear, but there's also a far-away sense, a sense that the sound is there, but it's traveling. It's going away from you." She said that once she was comparing a Strad with a Vuillaume, and though the quality was very close, she could still tell the difference because the Strad simply had that "old-world sound." A del Gesu will take more muscle than a Strad will; "With a del Gesu, you can give it as much as you to give it," she said. She complimented Sloan's del Gesu as having more range of color than others, "I'm hearing the bouquet of that great Bordeaux." Brown observed for the violin-making students: "It seems that the best instruments, to a player, produce a myriad of sounds -- they give you a palette." As for Elizabeth's own "Mendelssohn" Strad, it does quite a lot of traveling with her. Just this year it traveled with her to Sao Paolo, Hong Kong, Hawaii, Dublin, London, Los Angeles and more, all in the course of a few months. "It's slightly confused," she said. "It is happiest in the type of climate that is Cremona (Italy):" not too dry, not too humid. She has learned, over the years, that it is important to make her instrument work for her. "I've been on a journey to personalize my instrument," Elizabeth said. With the right luthier helping, this is possible. For Elizabeth, the right luthier has been New York-based violin maker Christophe Landon, who fashioned her a higher bridge (about 1/2 mm higher) of softer wood, and also made a sound post. The higher bridge has helped her to play better on the G string and the post has helped with the consistency of sound. She said that, for a while, she and her violin were kind of "sick" at the same time -- she was having shoulder and arm problems, and the violin wouldn't speak. But she and the violin have come out of it together as well, as she has transformed her playing approach to avoid injury and pain at the same time as she has physically made changes to the violin to serve her better. "It takes the strength of a butterfly to turn these pegs!" she said, describing how tuning the fiddle used to cause her physical stress. Somehow I missed that Elizabeth has been a spokesperson for these pegs -- and that she had outfitted her Strad with them! Ironically, I had just asked a few of my students to outfit their Kono violins with the Wittner Pegs, and one of them texted me, during Tuesday's performance, "What was the name of those pegs, again?" Indeed they make tuning very easy; and if students can tune easily, their instruments will more likely be in tune. If we have such technical things available to make our violin playing easier, why not? Elizabeth stayed around while the violin-making students snapped pictures of the instruments and spoke to each other about them. She tested a few people's instruments for them, and in a very gracious way. I could tell that it was very meaningful to a violin maker, to put his or her violin into the hands of a musician who can really find the core of its sound and appreciate its qualities. Perhaps as meaningful as it is to a violinist, who can find the luthier who can set her up to play in good health! Elizabeth was performing to benefit the Luzerne Music Center Youth Summer Camp, a camp in the Adirondacks for kids ages 11 through 18 which Elizabeth attended as a child and which she now directs. June 14, 2012 at 08:41 AM · I would love to participate in such an testing event too sometimes, unfortunately they are only for the very best players or for the ones who have the money to potentially buy expensive instruments. It is true, that trying out great instruments can inspire you alot and that one can transfer the concept of their sound to other violins. June 14, 2012 at 03:15 PM · As a first-row audience participant at this event, my initial impression during the musical presentations was that all of the violins sounded surprisingly similar... including Lydia's modern 3/4. It was only when Ms. Pitcairn played them individually, pushing them to the absolute limits of their capability, that the differences really were brought out, which to my ear was most evident as power and richness through the middle and lower range. As a listener, it is nearly impossible to tell how much effort and adjustment is required by the player to produce the music we hear. I'm sure that the real deciding factor between great, fine, good, and bad is what the player thinks of it. Unfortunately (and understandably), I didn't get to play any of them at this event. I believe there's an interesting story there, but I can't find the references right now and I may be conflating two histories, but I'll share it anyway... Jackson couldn't afford the Strad until a wealthy man stepped in and purchased it for her (I think for $5000). She ended up marrying him. If I'm remembering right and it's true, that's a pretty lovely romantic story. Annnnd even if I'm not remembering right, it would still be a lovely romantic story lol. June 14, 2012 at 04:20 PM · Wow, Emily, I guess so! I had no idea about that history, it's very cool to read the article about Leonora Jackson! I guess I'm glad that journalism has changed a bit since 1900; good heavens, the way they go on and on with that presumptuous description of the way she looks! If she was "shy" I feel like that Strad is a bit the same way; it just needs a bit of coaxing and then it really gives. Elizabeth made it sound amazing. June 14, 2012 at 04:51 PM · Someone asked how you choose "good" violins for something like this. I guess when you're the sponsor of the event you get to make that call. I'll never be able to afford a Strad or a del Gesu and my playing skill doesn't warrant wasting a great instrument's time anyway. I think there are modern makers who are producing awfully good violins and those are the kinds of violins that I would enjoy trying/playing and owning. June 14, 2012 at 09:09 PM · Yes, Dr. Sloan has owned the "Jackson" Strad for years. As for arranging for the instruments I do my best to provide great instruments and bows for my workshop attendees to study. I have a pretty good source of great instruments at any given time and being in LA they are passing through all the time. 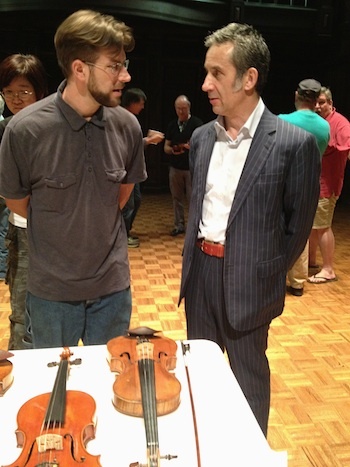 For this particular event, we had Christophe Landon showed up with a couple of fine instruments as did Michael Fischer. Both were last minute additions which added much to the event. I believe that people learning to build violins and bows must study great instruments and many makers never get the opportunity to work with anything but photos. Photos give you an abstract but holding and studying the real thing gives you the full experience. June 15, 2012 at 02:04 PM · What fun! If I start a violinist website, can I get invited to cool events like that one? June 15, 2012 at 05:31 PM · No need to start a website. 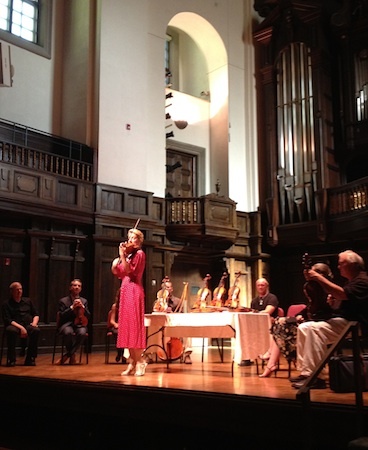 I mount an event for the Southern California Association of Violin Makers every year. That's what this was. SCAVM also co-sponsored the event along with Mr. Will Logan. So, Simply join SCAVM and you get invited and in the door free. Of course, my violin and bow making workshop attendees also get an invitation! I can address that, "wish I were there." 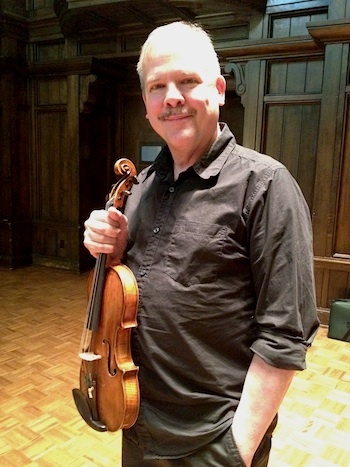 This event was sponsored and produced by Jim as a regular feature during the workshop for members of the Southern California Association of Violin Makers (who also participated in financial sponsorship), for whom attendance was free. To attend this feature in June, one can either join SCAVM or attend the violin making workshop. To join SCAVM, see our website. Past workshop events have included visits from Arnold Belnick with his 1700 Jupiter Strad and classes from people like Robert Cauer and Margaret Shipman. We always try to get exposure to great instruments in our meetings whenever possible; past meetings have included the Titian Strad, Amatis, Bergonzis, and many others to examine, sometimes to play as well. We're no VSA, but we do our best. June 16, 2012 at 11:30 AM · Is there, or will there be, any video of thie event, showing Pitcarin comparing violins, etc.? June 18, 2012 at 05:06 PM · Raphael took the question right out of my mouth. Hope there is a video. My stand partner has a Guarneri that I play frequently. A powerful sound that carries forever requires little effort. "Digging in" squashes the sound.